Roasted vegetables, actually grilled vegetables, is something I’ve written about, using vegetables like zucchini and portobella mushrooms, so I was attracted to a recent New York Times story about roasting vegetables. I’ve been forced to eat more veggies since my angioplasty, so I might as well make the most of it. The recipes in the Times article include root veggies common in winter and also fennel, an Italian veggie I grew up loving which now seems available more times of year than it once was. I think of fennel as a fall veggie. Indeed, we would have it as part of our Thanksgiving table of blended Italian and American dishes. 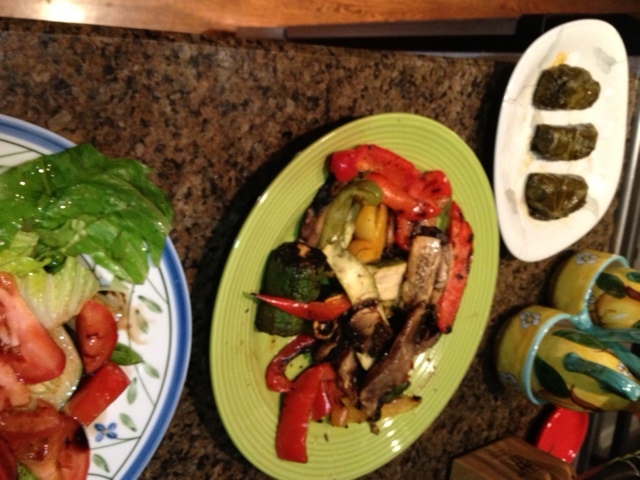 Grilled veggies with stuffed grape leaves and a salad, yum. But it’s showing up throughout the year now in many food stores. I love the flavor which some people tell me reminds them of licorice. I’ve never seen that connection, actually, but to each his own. I like it raw or boiled and then slightly broiled with a light coating of panko an/or low-fat grated Parmesan.